You will now have 4 listening exercises: 4 videos each followed by 1 quiz with IELTS listening tips. You will hear a man renting an apartment over the phone. First you have some time to look at questions 1 to 5. You can see that there is an example that has been done for you on this occasion only. The conversation relating to this will be played first. Hello, I want to rent an apartment. I saw your advertisement about two-bedroom apartment on Bridge Street. The woman answers the phone. Now we shall begin. You should answer the questions as you listen, because you will not hear the recording a second time. 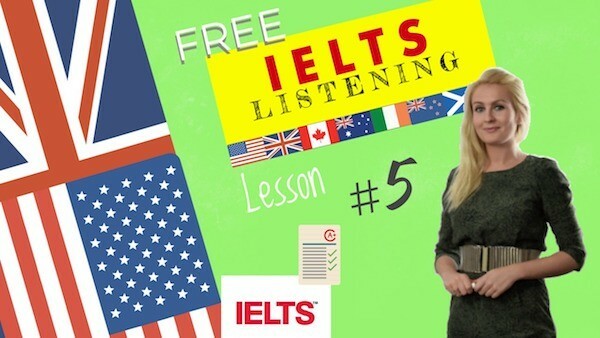 Listen carefully and answer questions 1 to 5. Bridge Street 32, that’s it? Yes,but I a couple of questions. Does rent include all the utilities such as gas, electricity, phone etc? Yes, sure. You are only responsible to pay the rent. The Leafs includes cost for such utilities as gas, heat, water, electricity, and phone. Great and what about the Internet? Unfortunately the Internet is not connected, but you shouldn’t worry about that. If you wish, you can contact the local providers to set up the connection. Okay and what kind of public transport is near the apartment? It is very close to public transport. There’s underground and bus station are about two blocks away. Very good. I think I’ll rent this apartment. Very nice. Could you tell me your full name, please? Yes, it’s John Hooper. Hooper is spelled with H-double O-then P-E-R. Thank you John. I’m Mary Dixon and I’ll be your apartment manager. You now listen and answer question 6 to 10. Now we need to meet to sign a lease agreement. Okay. What documents should I bring? First of all, we require proof of your identity. Then I can bring my driving license. I’m sorry, but driving licenses are not accepted. Could you bring your passport? Yes sure, and do you require a tax bill? No. We are not requiring any bills, but you need to present your current employment contract. No problem. I have it! Anything else? Yes. We also need a reference from a friend or colleague confirming your character. Okay and what about a reference from an employer? We used to ask tenants for this reference a few years ago, but now we don’t need it anymore. As well as the recent payslips they are not required. Very good. I think I have all the documents. Is it possible to meet you today? Yes. Is 5:30 p.m. convenient for you? Unfortunately I’m busy until 6:00 p.m.
Then we can meet at 6:30 p.m. Yes 6:30 is good for me. I’ll be out of the office by that time. I think it’s better to meet directly at your future apartment, because we’ll anyway make a visit. Oh you’re right. See you soon. That is the end of section one. You now have half a minute to check your answers. You will hear the information about tickets to one of the royal palaces in London. First you have some time to look at questions 11 to 16. As you listen to the first part of the talk answer questions 11 to 16. Thank you for deciding to visit historic royal palaces of the United Kingdom. Every year dozens of tourists choose to visit the Tower of London and we have a variety of tickets to suit your own interests. If you wish to make a single visit you can buy a single day ticket. This ticket enables you to visit only the Tower of London. The adult tickets cost is 24 pounds, children between the ages of 5 and 15 pay 18 pounds, and children under 5 can visit the Tower for free. For full time students, 16 years and over, and disabled visitors we offer a reduced tariffs. If you have a reduced tariff you pay only 19 pounds and if you’re going to make a visit with your family it’s a good idea to get a family ticket. The family ticket enables you to visit the tower and one other royal palace during one day. It costs 55 pounds and can be used by up to two adults and three children. For permanent visitors we offer an annual membership. The annual membership provides you unlimited entry to any five royal palaces and costs 107 pounds for both adults and children over five years. Now listen and answer question 17 to 20. If you can’t wait to visit these famous historical places and have already chosen your ticket type, then it’s time to order tickets. The first in the easiest way is to buy your tickets online. To do this you should visit our site and select the date, then make a payment. Make sure that after the payment is completed you receive a confirmation email of your booking. The second way is to book your tickets by telephone. However, you have to pay an additional fee when ordering tickets over the phone. Plus telephone bookings are not available during the weekends and holidays so this option is not very convenient and if you don’t want to plan your visit in advance there is a third option for you. You can simply purchase the tickets in person on the day of your visit. There are plenty of ticket kiosks near the Tower of London and other royal palaces. I hope that you’ll enjoy your visit. You will hear two students discussing their new course. First you have some time to look at questions 21 to 23. Hi Kate. How did you like the first lecture? Hi Julie. You mean the lecture about brand identity? Exactly, when our professor described how brand names are created. As I understood he’ll teach us practical tips and techniques to create better brands. What about course duration? I heard it’s five weeks. No, five weeks is without the final project. The total duration is seven weeks. Oh, I forgot about it. It’s the first time I’ll be doing a group project and I’m a bit nervous to work in a 5 people team. I think that’s going to be ok. He was talking about the right marketing strategy. Did you hear that? Yes, that was the most exciting part of the presentation. The key thing is to grab people’s attention. And how do you like the curriculum? I think it’s nice. It’s great that we all be learning marketing in detail as I’ve always been interested in this subject. Me too and after that we’ll be training to design custom logos. The professor told that the curriculum has been modified and we won’t learn design this year. What a pity! The same with product management, but you shouldn’t worry. They just combine these two sections into a larger one called branding. Then it’s good. Moreover, they’ve added something called e-commerce this year. and after that we’ll learn advertising. Really? Won’t analytics be replaced with customer attraction? Yes, you’re right. I forgot about that. I think that’s all. The professor also teaches a course called business strategies so we may take his other course next year. Deal, and where is the next lecture? It’s in the big classroom on the ground floor. Don’t forget to take your last week assignment.